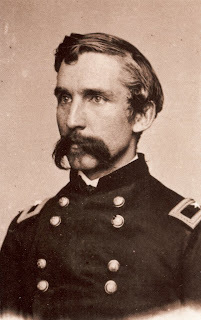 Yesterday I made my case for proving that this handsome bearded fellow on the left is actually a previously unknown photograph of Joshua Lawrence Chamberlain. Before you read this blog, you need to go read yesterday’s blog by clicking here. Despite the comparison photograph of Lawrence making the bottom of his earlobe look pointed, the size and features of both of the earlobes are the same. 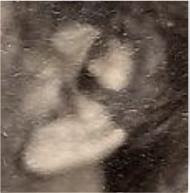 The trouble with trying to identify a person through nineteenth century photographs is that the photographs are going to be blurry and out of focus sometimes. Tricks of the light can actually make the same person look totally different in various photographs. 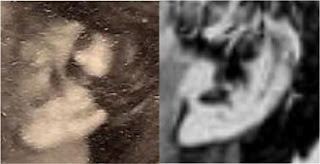 Here are two photographs below that show Lawrence’s earlobe as being rounded at the bottom, to dispel any possible doubts. In my opinion, the ears are too close to matching to say it’s just a coincidence, especially when you add everything else from yesterday’s blog to the case. 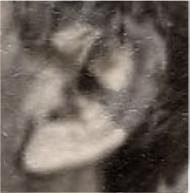 Of course, I will never be able to say for certain beyond a shadow of a doubt that the bearded man is Lawrence without a historical smoking gun like a letter or something that specifically says, “I had my picture made today and my beard looked especially bushy,” or something to that effect. 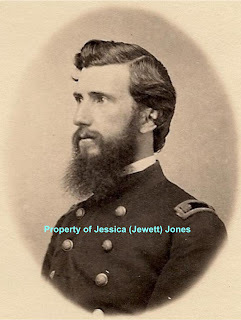 Regardless, the bearded man fought in the Civil War. I will give him a good home among my other Civil War artifacts whether he is historically proven to be Joshua Lawrence Chamberlain or not. That’s just what I do. What do YOU think? Is there enough evidence to say the bearded man is Lawrence? >I still think it is Lawrence… The ears look too alike and even my own ears look pointy in some pictures (like my Senior pics) while all others they are rounded (every other picture known to be me). Go with your gut that it is Lawrence. I definitely think it is Chamberlain! He is my favorite officer. I also sent you an email in your contact folder on your website to ask your permission to use it as an avatar on my civil war site. Certainly would not be for any profit! I would use the picture that has your name typed across the front of it. It should even bring more people to your website!I thank you for your permission to use it if you see fit to grant it!